This calm, self assured guy is Buddy. 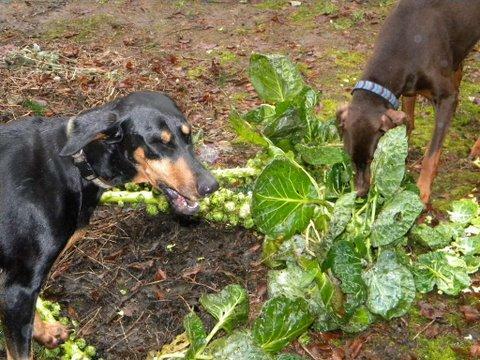 He has trained two generations of dobies and is working on our latest dog child. I don't know why he feels the need to bring in live rodents, but Buddy just brought in his latest catch tonight, or should I say this morning. Ugh! Pulling out furniture, baskets and chairs during the mad chase to corner a skittering squeaking creature at two in the morning is not the kind of adrenaline rush I want at that time of day. Ciara is getting better at snapping them up, but it really helped having someone like Amber small enough to get behind and under big pieces of furniture. Amber kept it moving, so I could do as much squealing as the poor doomed adolescent rat. I was sure our two weeks of low temperatures that dropped into the single digits for multiple days would be the undoing of my brussel sprouts and all-season cauliflower. The kale I expected to survive, but you never know.... The smell of decaying cole crops was heavy in the back yard, but my work schedule has me leaving in the dark and getting home in the dark. Our short 8 hours of daylight days mean I see little, since the backyard lights only hit the edge of the garden. I would have to wait until the week-end to see the damage. 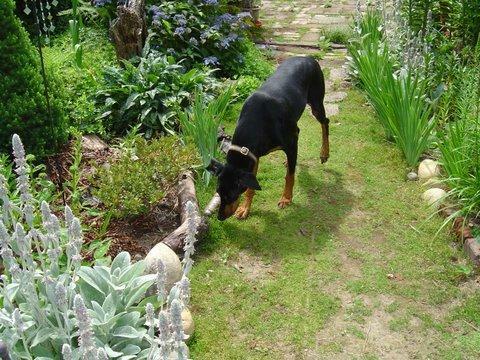 The dogs, Ciara and Kota had been slipping into the garden area where a hydrangea was just stems. 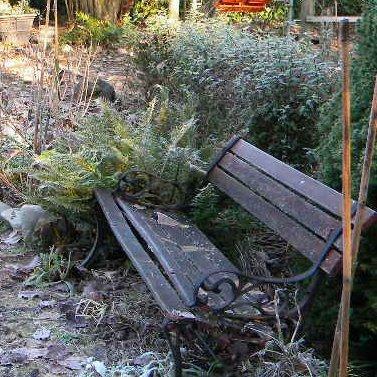 I put up some old fencing to try and keep them out, but they were stepping on an old garden bench and stepping over. All this time I figured they were drawn by the reek of rotting vegies. Today I was surprised that they had been eating good vegies that were not rotten. 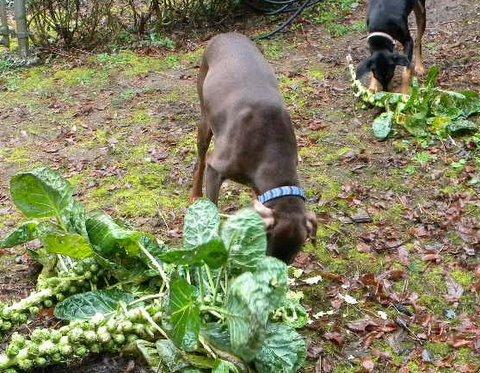 They were enjoying tasty sprouts and the heads of some of my cole crop vegies. 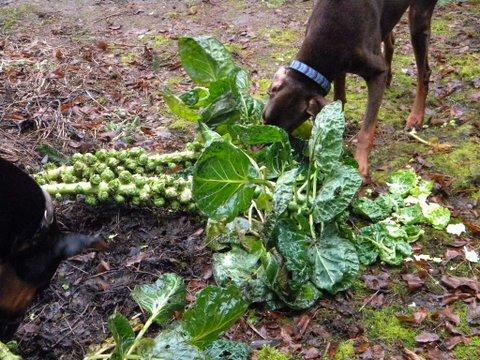 Well, I was not real enthusiastic about harvesting brussel sprouts, so after munching on a few and gathering a few I pulled four of the dozen plants for the dogs. 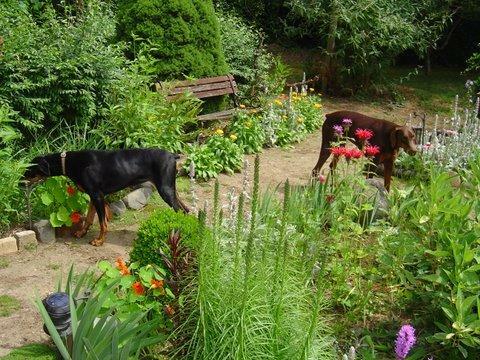 Ciara and Kota will enjoy them for some time and hopefully stay out of the garden leaving the rest to us. What else was I to do? Yes the cold did damage, but it was mainly to the tender leaves at the bottom of the plants which rather surprised me. All the cole crops are now really, really sweet and ready for harvesting through the winter. The variety of kale I grew this year was much more susceptible to cold unlike the hardier varieties that I have grown in the past. It is still good, just not as sweet as the sprouts. 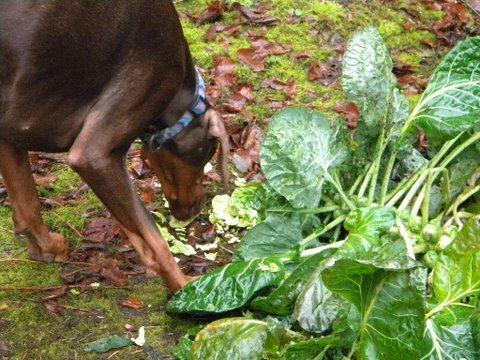 Over all I am pleased and with luck, come spring I will still get some very early cauliflower....if the dogs don't eat the plants before then. Some years are just tough for whatever reasons: Work might be overwhelming, illness might take an incredible toll, family challenges and changes might occur. 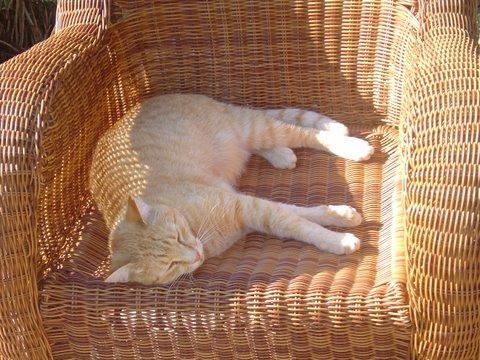 Though all of those things have happened I have always had an animal friend that has given me great joy, adoration and laughter in my life in difficult times and in good. It is a choice that not all people can understand, and I respect that but for me it has been as much a part of me as having a garden, plants, and breathing. I simply can't imagine life without these blessed creatures that share our lives. This last year has been especially gut renching. We have not only had job losses, and huge economic challenges we have also lost a number of animal companions. We outlast our pets so have to come to grips with dieing and loosing a piece of ourselves each time they leave us. Thomas was my 18 year young tuxedo kitty. He was my shadow and never left my side when I was home. 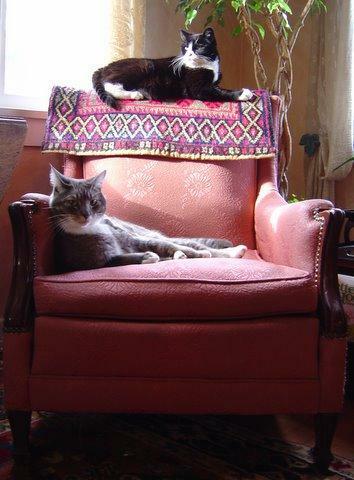 My husband could never be jealous because he had his own shadow in Rocky, a gray and white furball. 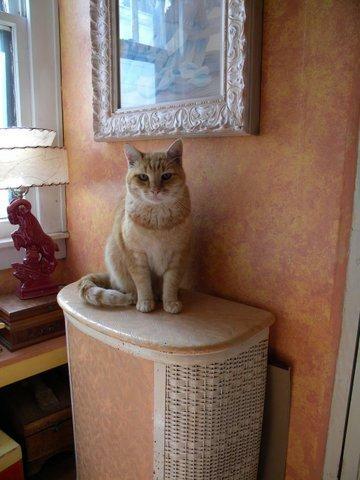 We lost Thomas over a year ago, and then unexpectedly Rocky this last spring at the young age of only 8 years (kidney failure). 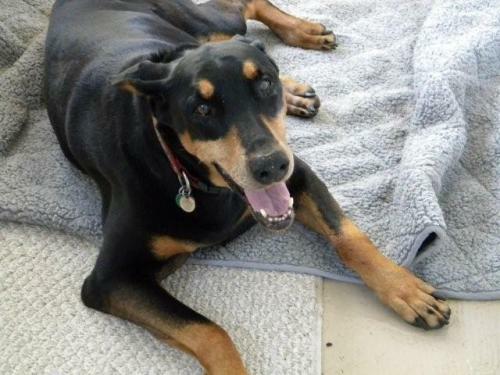 Ruby, my old Doberman, developed cancer and had to be put down this month. I had gotten her for a birthday present 12 years ago. She too was my shadow with a big and loving heart. It got so that during her last days I would try to stay in one room because it was so hard to watch her try to follow me where I went always with a big grin on her face. 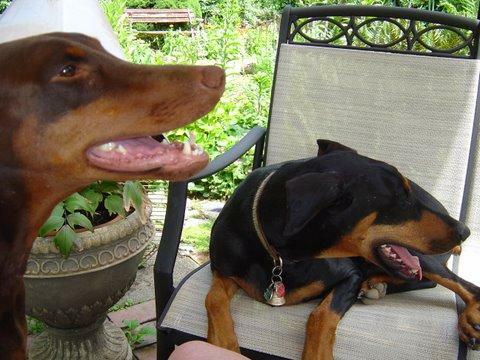 Ciara, was a rescued Doberman that kept Ruby playing and moving when she was well. 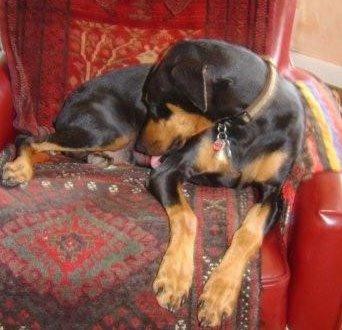 Ciara's personality got sullen and crabby as Ruby got more ill. We had half-heartedly looked for a companion for Ciara, but didn't want to introduce a new dog into the household when Ruby was ill. 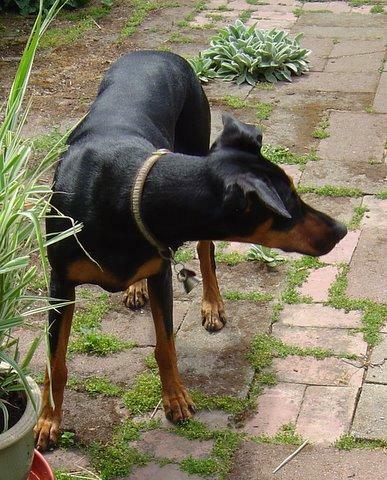 The Doberman Rescue had what sounded like a perfect dog for our household about Ciara's age (4 years). I had emailed once, but did not follow through about the dog, Dakota. We prepared ourselves the other week, and made the awful decision to take Ruby in for her last visit with the vet. Afterwards we brought her home and buried her. 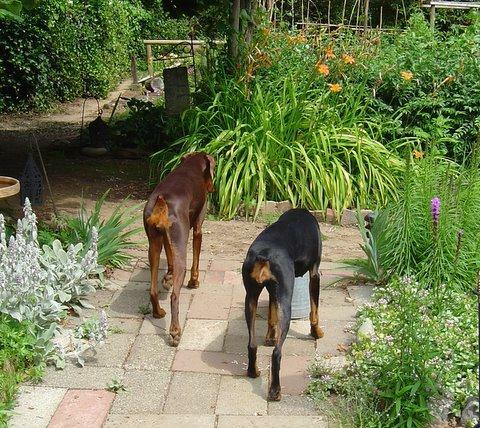 That day I wrote a note onto Craig's List about wanting to provide a home for an adult Doberman in need. It was an attempt to put my grief to some use, and my silly way of saying I had lost a dear friend, and her companion had also lost her friend. I was surprised to recieve an email the same day from the owners of Dakota. 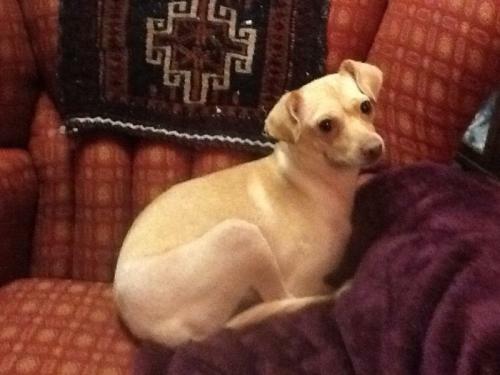 Changes in their circumstances had made it so that they had to give her up. They were desperate to find her a home. We met with both dogs, and the ladies (Dakota and Ciara) got on well. Dakota came home with us. She is a good dog. Not Ruby. Dakota has a totally different personality, but a velcro dog none-the-less. Ciara and Kota are working out some minor pack order disputes, but play hard in the back yard when they aren't lounging on the sofas. Oh yeh, Buddy, our only cat now is doing just fine at teaching Kota manners. 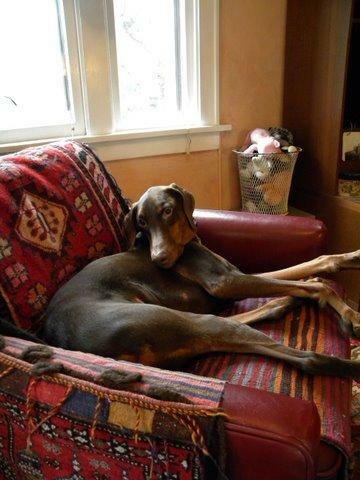 He is a second generation Doberman cat. Though life has many changes...maybe because that is what life is...change...My sweetie and husband said, "Each time a door closes, another opens." As hard as it is to see sometimes it is definitely true. We just have to be willing to walk through it.